Our outreach programs include"Voices Out of Silence" and "Cuentame un Cuentito/Tell Me a Story" and they are both provided to schools free of charge. "Voices Out of Silence" is a suicide prevention program for teens. It includes a performance based on stories taken from interviews and personal writings of teens who have attempted suicide and survived and thrived. Following the performance there is a panel discussion run by teens that highlights risk factors and places to go for help. In addition, through our partnership with Second Wind Fund, students who are uninsured and under-insured are able to access outside counseling. This program is brought directly to local middle and high schools, impacting approximately 750 students a year. "Cuentame un Cuentito/Tell Me a Story" is a bilingual show that integrates Latin American folk tales with music, projections and dance. We bring the show to 10 schools annually, impacting over 2,500 students. The schools we choose have a high percentage of free/reduced lunch students (over 90%) and English language learners (over 50%). Each of the stories is selected for their messages on bullying, individuality, being true to yourself, and kindness. Thanks to our presenting partners McDonald's Owners/Operators of the Greater Denver Metro Area. Hear what teachers have to say about our recent Cuentame performance! "Thank you so much to Stories on Stage for coming to Doull on April 5th. This performance was the most engaging assembly we have had at Doull, the students eyes never left the performers. Having a bilingual performance was so much fun for our Spanish speakers. However, the passion of the performers is what made this assembly one not to be missed. Thank you so much for tailoring an assembly that addresses our diverse population and letting our students know that they are not alone in this journey!" 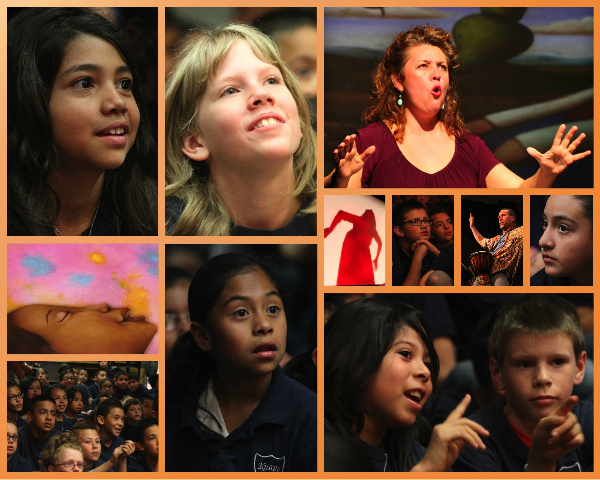 "I would highly recommend the “Cuentame…” assembly to any elementary school! These storytellers use simple materials creatively to create props and setting Their facial expressions make you laugh and tear up. This assembly is very “affirming” to bilingual students who navigate English and Spanish speaking worlds." "Thank you so much for spending the morning at Doull. Our 2nd-5th graders truly received an inspirational gift. This show was captivating, humorous, and simply beautiful! The actors were amazing; their expressions, voice, creativity, and use of props were so mesmerizing for the audience. It was so wonderful for our students to hear stories they could relate to, this assembly sent a powerful message and this show opened up some incredible conversations about what it feels like to be a second language learner. Thank you for inspiring and validating our amazing students here at Doull!" Voices Out of Silence Cuentame un Cuentito Both!